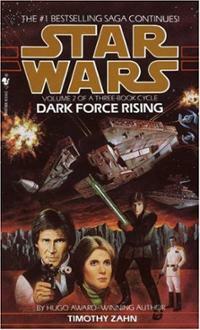 In the fourth episode of The Star Wars Stacks, Chris, Jen and Joe discuss the second novel in the Thrawn trilogy, Dark Force Rising, written by Timothy Zhan (Publication Date: June 1, 1992). We begin by discussing a bit of Episode VII news including casting and general secrecy surrounding the production, in addition to what small tidbits have been let out for public consuption. Next, we get into the spoiler free section where we give a “back cover” overview of the novel and our initial general impressions. Finally, the good stuff. After the alerts we get into the spoiler seciton. If you haven’t finished the book, or haven’t started it yet, listen to the first half of this episode then pause it when you hear the alert. Return to this episode of the Star Wars Stacks when you have finished the novel and are ready to hear the full discussion. One month from now, The Star Wars Stacks will release the next episode: a review of The Last Command by Timothy Zahn. Do you have comments on this episode? MP3 audio, emails, Tweets and Facebook feedback welcome! Just listened. Still loving it. Great website. Splendid! Thanks! Glad you’re enjoying things.